Description - She was originally 1 of the 4 Sensational Sisters, but she left for an unknown rreason. She meets up with Ash, and follows him until he pays her back for her bike. She is also a gym leader, and 1 of the 4 keepers of the Cascade Badge.She seems mean (Because of hitting everyone with mallets), and she’s stubborn (very), like Ash. But, she’s also sweet and caring. Who's Misty? Misty is a character that ash meets during the second episode. Ash "borrowed" her bike. She loves Water type pokemon. At first she doesn't like Ash. They become friends and travel together. Ash finds out she is a leader at the Cerulean City Gym. Her favorite pokemon: Staryu, Starmie, Horsea. least favorite: PSYDUCK!! Misty i s the Cerulean City gym leader. She also has traveled with Ash Ketchum on his incredable journeys. She has been in the story every since Ash broke her bike. She enjoys water Pokemon the most. Favorite Saying - "Ask Ketchum, I'll stick to glue with you until you pay for my bike. Misty Waterflower is a Water Pokemon Trainer. She trains and collects Water Pokemon. At the moment her collection includes: Goldeen, Poliwag, Psyduck, Staryu, Starmie, Togepi, and Horsea. Misty has a crush on Ash, and she uses her "bike" thing as an excuse. Have you noticed she like....hasn't said ANYTHING about her bike lately? Hmmmmm... ^_^. Anywayz, Misty is the first person to meet Ash, and its *well almost* luv at first sight. Ash and Misty are good friends.....and more than just friends now...*in the last episode they kiss!! * Theres one part about the series that I hate. WHERE IS THE EPISODE BEAUTY AND THE BEACH??? 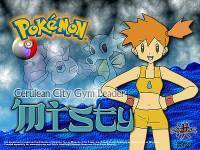 Misty is a co-leader of the Cerulean City Gym with her sisters. While fishing one day, she “catches” Ash. He subsequently steals her bike to get Pikachu to safety. She decides to tag along until he gets her a new Bike. We learn along the way that Misty is EXTREMELY afraid of Bug-Type PokèMon. 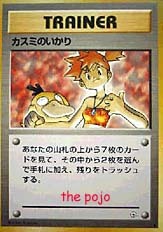 After Brock leaves and Tracey joins, Misty decides to remain with the Pokè-Destined (hehehe). Now, with the return of Brock, Misty is more confident than ever, and having (mostly) forgotten about the bike, will travel into Johto with the group, eager to become the World’s Greatest Water-Type PokèMon Trainer! One of the 4 sensational sisters. She joins up with Ash in the 2nd episode and has been in EVERY one of the 324 episodes since then. She has Staryu, Starmie, Horsea, Togepi, and Psyduck. She is very stubborn and hotheaded and may get angry on a moment’s notice (mostly from Ash or Psyduck’s brainlessness). Her Psyduck usually pops out when another Pokemon is supposed to. Some say she has a secret crush on Ash and uses the old bike excuse just to come along. I agree strongly. Obviously, I disagree with this “issue” over seas, and in the conscious minds of fans here. Then again, that’s just my opinion. If this is to posted, please label it as from “Unown_N”, which is the online name I maintain. Misty is a water-pokemon trainer and plans to be the best water-pokemon trainer in the world.Her home is the Cerulean City Gym.She really dislikes her sisters Lily,Daisy,and Violet. One of the most common facts about Misty is that she likes Ash.When she met him in the first(or second)episode,she blamed him for destroying her bike(it was actually Pikachu's thundershock).Haven't you noticed that she.....hasn't mentioned her bike lately.She's been following him around ever since Pikachu destroyed her bike.In the episode,"Beauty And The Beach," she gets angry just because Ash says she looks like a girl.Misty's yet stubborn like Ash,but she doesn't have her reasons. In some episodes,she almost confesses that she like Ash,but she doesn't.I HEARD THAT ASH AND MISTY ARE SUPPOSED TO KISS IN THE LAST EPISODE!!! Misty Waterflower ("Kasumi,"is her japanese name), is the eleven year old, "Fourth Sensational Sister." But, to many, is merely, a "runt." Misty (before she met anyone and set out on her journey) lived with her 3 sisters, Daisy, Violet, and Lily, in the Cerulean Gym, in Cerulean City. Misty left her home and sisters, telling them that she would "return when she was a great Pokemon Trainer." Ash and Misty soon meet Brock Slate. The Pewter City gym leader. Misty and Brock become close, and soon have a brother/sister relationship. Ash and Brock become really close friends, also. Later, in the Orange Islands, Misty and Ash meet Tracey Sketchit. Tracey is a Pokemon Watcher. Tracey sketches, and learns, about Pokemon a lot. Tracey and Misty don't become too close, but Ash and Tracey become pretty good pals. trusting something she has known about all her life and still learning more. ourselves. If you want to find substancial evidence proving that these two like eachother, some of the Orange Island Adventures shows have just what you need. Even the movie, Pokemon 2 has some evidence. Well thats all i have to say.